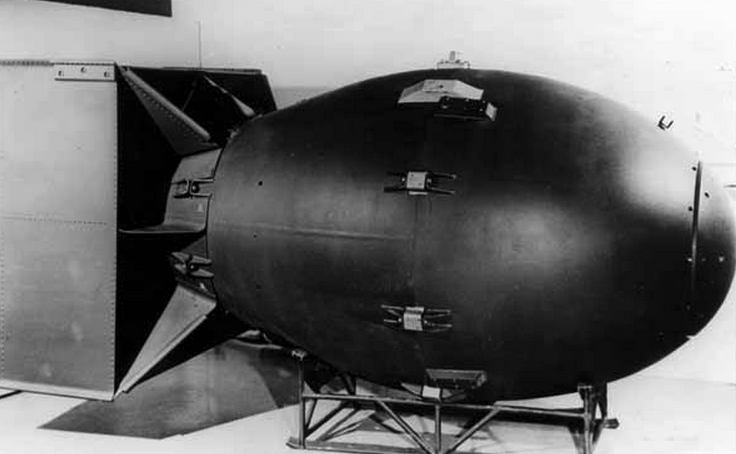 As many know, the atomic bomb has been used only twice in warfare. The first was at Hiroshima. A uranium bomb nicknamed “Little Boy” (despite weighing in at over four and a half tons) was dropped on Hiroshima August 6, 1945. The Aioi Bridge, one of 81 bridges connecting the seven-branched delta of the Ota River, was the target; ground zero was set at 1,980 feet. At 0815 hours, the bomb was dropped from the Enola Gay. It missed by only 800 feet. At 0816 hours, in an instant, 66,000 people were killed and 69,000 injured by a 10-kiloton atomic explosion. The area of total vaporization from the atomic bomb blast measured one half mile in diameter; total destruction one mile in diameter; severe blast damage as much as two miles in diameter. Within a diameter of two and a half miles, everything flammable burned. The remaining area of the blast zone was riddled with serious blazes that stretched out to the final edge at a little over three miles in diameter. On August 9, 1945, Nagasaki fell to the same treatment. This time a Plutonium bomb nicknamed ” Fat Man ” was dropped on the city. Though “Fat Man” missed its target by over a mile and a half, it still leveled nearly half the city. In a split second, Nagasaki’s population dropped from 422,000 to 383,000. Over 25,000 people were injured. Japan offered to surrender on August 10, 1945. NOTE: Physicists who have studied these two atomic explosions estimate that the bombs utilized only 1/10th of 1 percent of their respective explosive capabilities. While the explosion from an atomic bomb is deadly enough, its destructive ability doesn’t stop there. Atomic bomb fallout creates another hazard as well. The rain that follows any atomic detonation is laden with radioactive particles, and many survivors of the Hiroshima and Nagasaki blasts succumbed to radiation poisoning. The atomic bomb detonation also has the hidden lethal surprise of affecting the futuregenerations of those who live through it. Leukemia is among the greatest of afflictions that are passed on to the offspring of survivors. While the main purpose behind the atomic bomb is obvious, there are other by-products of the use of atomic weapons. While high-altitude atomic detonations are hardly lethal, one small, high-altitude detonation can deliver a serious enough EMP (Electro-Magnetic Pulse) to scramble all things electronic, from copper wires to a computer’s CPU, within a 50-mile radius. During the early history of The Atomic Age, it was a popular notion that one day atomic bombs would be used in mining operations and perhaps aid in the construction of another Panama Canal. Needless to say, it never came about. Instead, the military applications of atomic destruction increased. Atomic bomb tests off of the Bikini Atoll and several other sites were common until the Nuclear Test Ban Treaty was introduced.